When it comes to watching your grandkids, do you enforce her rules or pass the buck? You’re babysitting your six-year-old grandson. He wants ice cream, but your daughter-in-law (DIL) gave you express instructions not to serve sweets before dinner. What do you say? If you answered A, congratulations! You passed the model mother-in-law test. If you answered B, your DIL is about to become very angry. Why? Instead of taking responsibility for disciplining your grandson, you made her out to be the bad guy. 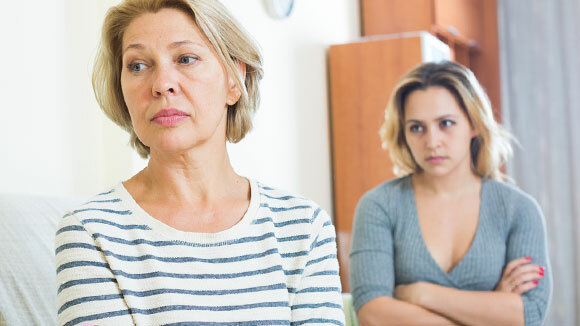 That blame doesn’t just anger your daughter-in-law; it shows grandchildren that Mom and Dad’s instructions are up for debate. “To the parent, it just feels like they’re being undermined, which they are,” says Brann. Shifting the blame once or twice is frustrating to parents, but not necessarily a big deal. (Chalk it up to grandparents’ prerogative. See below.) Doing it consistently, especially if you’re a primary babysitter, is another matter entirely. If you watch your grandkids regularly or your children look to you for permanent daycare, parental guidelines must be enforced—and you must be the one to do it, without passing the buck. The reason for this is twofold. Taking responsibility for the rules, A) keeps your kids happy because it avoids challenges to their authority; and B) prevents behavioral problems with your grandchildren down the line. Kids listen to people who act like they’re in charge. If you have a problem with the rules themselves, bring it up to your son and daughter-in-law privately, away from the children. Then, work towards a solution. Of course, the best way to avoid potential conflicts is to discuss rules with parents before beginning your childcare stint. “Sit down and talk about what the expectations are in advance,” says Brann. If Mom’s rule says the kids can jump on the couch, but Grandma thinks it’s dangerous—Grandma wins. Moving forward, cultivate a relationship that allows you to address future issues. “Make it okay for both sides to say, ‘I’m having a problem, let’s sit down and talk about it,'” Brann says. The one exception is safety. If Mom’s rule says the kids can jump on the couch, but Grandma thinks it’s dangerous—Grandma wins. There’s no debate about immediate hazards. Provided it’s somewhat expected at and least grudgingly tolerated, there’s room for rule-blaming if you only occasionally mind the grandkids, rather than act as a full-time caretaker. “It makes a huge difference,” says Brann. “If it’s once in awhile, it can be an inside joke, because typically grandparents don’t discipline often.” The family rules should be enforced overall, but there’s no harm in having a little fun. In fact, if you’re only going to watch the grandkids once in awhile, Brann suggests, “Make it a Grandparent Day” (not to be confused with Grandparents Day), during which the rulebook gets thrown out the window. Eat ice cream for breakfast, watch an extra hour of television, stay up past bedtime—anything goes. Ultimately, the goal of rules isn’t to cause rifts in your family. It’s to keep kids safe and give them structure for a healthier youth. When you take responsibility for enforcing them, you become part of that important developmental process—and everyone is the happier for it.